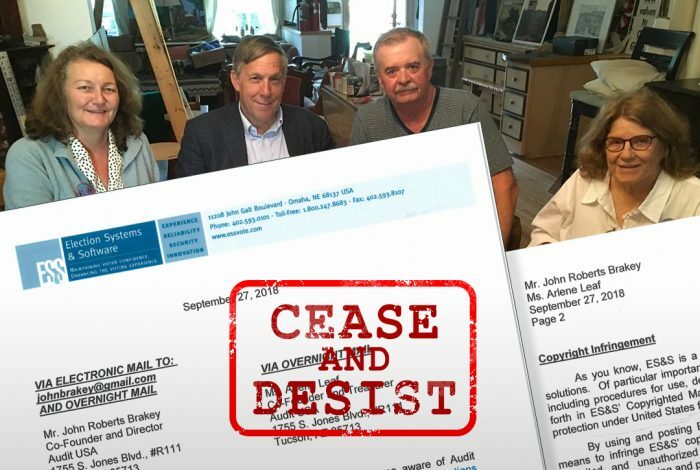 An Arizona-based election transparency activist group has received a cease-and-desist letter from the largest voting-system vendor in the US. Election Systems & Software (ES&S) sent its letter threatening to file a lawsuit against Americans United for Democracy, Integrity and Transparency in Elections (AUDIT-USA) this week. In the cease-and-desist letter, ES&S claims that the nonprofit has used materials belonging to the voting machine manufacturer, and that is a violation of copyright law. “By using and posting ES&S’ Copyrighted Materials, Audit USA is providing a means to infringe ES&S’ copyright in its materials by enabling others to engage in unlimited and unauthorized downloading and publication of ES&S’ Copyrighted Materials,” the letter says. However, Brakey argued that he was able to come into possession of ES&S product manuals through public record requests or through secretary of state offices in the country and that the bottom line is that ES&S does not want him, or anyone in the public, to have access to these manuals. Brakey told WhoWhatWhy that AUDIT-USA has had issues with ES&S in the past regarding the sharing of product information about the voting machine company with the public. However, he added that the threat of legal action would not deter him or his group. “We are being effective, and we’re getting people to ask questions about how their election system is working,” Brakey said. One of the main motives Brakey has for sharing information about voting machines through the manuals is to inspire voters. He wants to prove that it’s possible to make elections transparent and accessible to US citizens. The current threat the nonprofit has received has not stopped the organization from following its mission’s goal. Brakey and AUDIT-USA continue to publicly share concerns about state election departments around the country that destroy election ballot images. These digital images, under the law, are supposed to be saved for 22 months.